An example of what the new Northumberland County Council headquarters in Ashington could look like. The Tories went on the attack over the move of the council’s HQ to Ashington, but were roundly criticised for ‘their’ Government’s cuts during the budget debate this afternoon. The final approval for the budget for 2016-18 and the medium-term financial plan from 2016 to 2020, which will cut another £57.9million, was given at a full meeting of Northumberland County Council. Almost £12million will be cut in the coming financial year followed by just under £6million in 2017/18. Council tax will rise by 1.99 per cent – the maximum allowed without holding a referendum, while the council will also add an additional two per cent for use on adult social care, a special precept offered by the Government. But as expected, the move of the authority’s headquarters to Ashington from Morpeth formed a large part of the debate. Conservative group leader, Peter Jackson, who described the proposed new County Hall as ‘the largest vanity project of our lifetime’ and a ‘palace for councillors’, moved an amendment to remove the capital funding for it from the budget. He said that it had not been proven that anything is significantly wrong with the current headquarters and other options – the likes of Bedlington and Cramlington, if not Morpeth – were not investigated. Other Conservatives called for the decision to be put to the people of Northumberland, perhaps via a referendum on June 23 when the EU vote takes place. Coun David Bawn said that residents in the county are angry about the decision, so ‘as a politician, I thank you, but as a taxpayer, I'm furious’. The amendment failed, however, as Labour and independent councillors voted against it, while the Lib Dems were split. 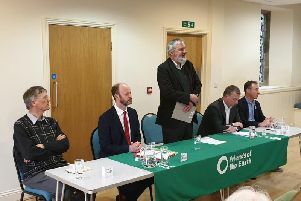 Group leader, Jeff Reid, was against the move because he believes it is only private money that will help regenerate the town, not public money, but Coun Heather Cairns and Coun Gavin Jones were supportive due to the jobs and investment coming to Alnwick and Berwick respectively. Council and Labour leader, Grant Davey, said: "The move to Ashington is a good move, getting money out of this building is a good move, it’s a good move for staff – add it all up and it’s a brilliant move." Earlier in the debate, Coun Jackson criticised the ‘smoke and mirrors project’ from the Labour administration, which is ‘spending like there’s no tomorrow’ on capital schemes. But Coun Reid said accusations of smoke and mirrors from the Tories were ‘diabolical’, giving the example of the Chancellor’s permission for a two per cent council-tax rise to fund adult social care which simply replaces funding removed elsewhere. He added: "How can we be expected to survive if all they ever do is take money off us?" Independent group leader, Paul Kelly, said: "The budget that has been presented to us today is sound and doable given the appalling circumstances under which local government is working." He said that some of his best friends are Tories, but cannot believe they are going along with the party's move to make everyone pay for all local services, later adding that they are ‘too lazy’ to produce an alternative budget.